So many of you may have read the ominous FDA warning, “These treats could kill your dog.” You probably anxiously perused the article, ensuring you weren’t endangering your best friend’s life with these deadly “bone treats”. Well, in fact, this article is absolutely correct…kind of. Bone treats is a little broad of a term, but certain bone treats are extremely dangerous for our pets. The most commonly made mistake is an innocent one. Many pet parents think they are giving their pets a well-deserved treat by giving them the leftover ham, turkey, or chicken bones. In fact, cooked bones are some of the worst for dogs. The process of cooking them actually makes them extremely brittle, so as your dog chews them they are more likely to break and splinter. If they splinter, it can cause excessive damage to the mouth and intestines of the dog. Or, if the bone simply snaps in half, your dog may attempt to swallow it, which can lead to choking, internal blockages, and surgery. In fact, chicken bones are a major cause of choking incidents in dogs. Many owners think because of the small size and malleability of the bone their dog will be fine. But, what really happens is the dog immediately attempts to swallow it, as it seems to fit into their mouth, and the bone can get jammed in their esophagus. An extremely important factor in picking out bones for your dog is the size of them, and it is where many dog owners go wrong. But, the article we are talking about has a different focus. It mainly mentions the dangers of pre-packaged or store-bought bones, especially artificially cooked and flavored ones. You may have seen these types of bones at PetSmart or Petco. In fact, on one company’s packaging for a “Real Ham Bone” it has a warning that states, “the bone is to be chewed over several sittings, not eaten…remove bone immediately if splintering occurs or small fragments break off”. This means they are completely aware of the dangers of these bones, and that they are indeed splintering. Cooking, smoking, or curing a bone all has the same effect on it. This company has already had hundreds of customers whose dogs either died or became seriously ill because of the bone fragments doing severe internal damage. There is also the added fact of preservatives and fake “smoke” flavorings, because our dogs really want a bone that is flavored instead of natural? You may believe given your dog a smoked bone, or “real ham bone” as seen in the earlier case, is a great treat, but there are better options available here at the Yuppy Puppy! Anyways, as the FDA article posted, the dangers of these smoked bones are many. They have already had over 70 cases of sickness or injury related to “bone treats” with the potential outcomes including; gastrointestinal obstruction, choking, lacerations in mouth/esophagus, vomiting, diarrhea, rectal bleeding, and death. They have also had fifteen reported deaths from eating the wrong kind of bone treats. The important distinction to make here is, not all bone treats are bad. Similar to how we should eat, McDonalds may taste good, it may look good, but is it good for us? 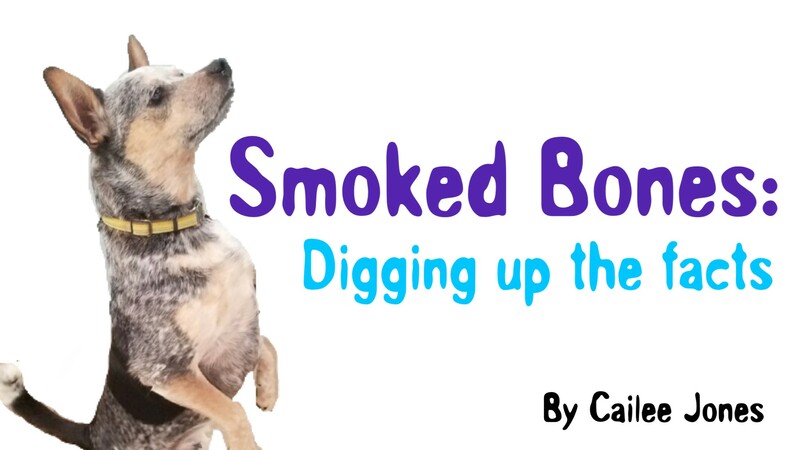 It is important to remember that dogs don’t distinguish between “smoky” flavors and the natural flavor of a meaty bone. Raw bones can do so much for a dog’s health, compared to artificial smoked or cured bones. For the holidays this year, consider stuffing your dog’s stockings with a wholesome raw meaty bone from the Yuppy Puppy, and just watch how your pal’s tail will start wagging! The good news is, recreational chews such as raw marrow bones or turkey necks are a great fix. They are enjoyable to chew, healthy for your dog, good for plague buildup, and without the many dangers of smoked bones. Marrow bones are not meant to be consumed completely, but gnawed on so the dog can enjoy the marrow on the inside. Turkey necks are a great option because the vertebrate’ are relatively small and can be chewed on without breakage. No matter the type of bone you chose, remember to never leave your dog alone with it. This isn’t because all dogs try to swallow bones, but there are some goofy ones out there (like mine) who will try to swallow an entire turkey neck. Continuing on, there are different types of bones you can try as well. Lamb bones, for example, are a slightly softer bone and would not be recommended for an extremely heavy chewer. Beef bones are much harder and can last a lot longer. It is also important to consider the sized of the bone in relation to your dog, as I mentioned earlier, too small of a bone will pose a choking hazard. One vet recommends choosing a bone that is as long as or longer than your dog’s head. This will ensure that it cannot be swallowed or fit whole into their mouth. It will also, hopefully, prevent accidents such as their jaw getting lodged inside or on the bone. When presenting your dog with a raw bone, especially marrow bones, ensure your dog is simply chewing or grinding on the bone to try and get at the marrow. There should not be cracking sounds, and if there is, your dog might be too heavy of a chewer for those. We tend to avoid rib bones if possible, only because they have greater chances of breaking into separate pieces (the different ribs, of course). A great choice for a heavy chewer would be a meaty bone, which are great sources of calcium! Overall, though, it is very personal to the dog, and there are always risks, but at the Yuppy Puppy we are happy to find a customized choice for you, based on your dog’s age, health, and chewing style. “Bones Can Kill Your Dog So Find Out Which Ones Are Safe.” Mercola.com, healthypets.mercola.com/sites/healthypets/archive/2010/05/19/caution-bones-can-kill-your-dog-find-out-which-ones-are-safe.aspx. Commissioner, Office of the. “Consumer Updates – No Bones (or Bone Treats) About It: Reasons Not to Give Your Dog Bones.” U S Food and Drug Administration Home Page, Office of the Commissioner, www.fda.gov/ForConsumers/ConsumerUpdates/ucm208365.htm. “Dangerous Dog Bone? Concerned pet owners warning about Real Ham Bone.” FOX6Now.Com, 3 May 2015, fox6now.com/2015/05/03/dangerous-dog-bone-concerned-pet-owners-warning-about-real-ham-bone/.